Carrick Petroleum Inc. (Carrick) was incorporated in the Province of Alberta on August 3rd, 2011 subsequent to the sale of Culane Energy Corp. (Culane) to Barrick Energy Inc. on July 31st, 2011. The management team from Culane decided to continue with its business model and moved forward with the formation of Carrick and a new slate of Board of Directors that brought additional skill sets dealing with high end oil and gas exploration projects to the table. Both the management and the Board realized that to achieve the best possible return for investors, (especially in the current oil and gas environment) success had to be through the drill bit, combined with a high working interest position and located in an area where most companies weren’t already deeply entrenched. The product needed to range from light oil/condensate in the case of an oil well to being liquid rich and/or condensate rich in the case of a natural gas well. These types of products would be able to generate the highest possible net backs and highest rates of returns for all of Carrick’s investors. In order to deliver these results for its shareholders, Carrick has focused its exploration efforts in the Stolberg area located along the Eastern foothills thrust edge, in West Central Alberta. Conventional drilling projects do not require the need to inventory huge tracts of land that non-conventional resource plays do. 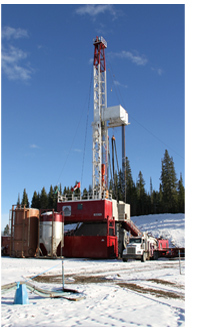 Conventional foothills wells often encounter higher reservoir pressures, higher well production rates, lower production declines and larger oil and gas reserves resulting in higher rates of return. There is also a higher operational risk associated with the drilling of structurally complex foothills wells but that risk is greatly outweighed by the higher returns that can be realized with success. At the end of the day you still have to drill in the right place. Historically over the years a number of small companies have ventured into the foothills and failed. 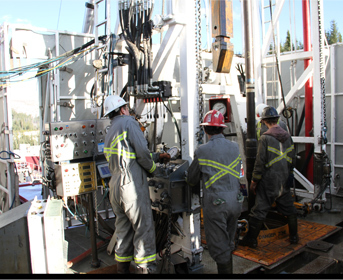 Carrick possesses the technical expertise to be successful in the foothills and has currently completed and tied in its first liquids/condensate rich natural gas well. The Stolberg multi-zone oil and gas project was developed by the President of Carrick 20 years ago while working the foothills Eastern thrust edge as an independent petroleum geologist. Attempts were made at that time to either acquire or farm in on the Stolberg lands but the lands were very tightly held by a major oil and gas company and a deal was not possible. Two years ago Carrick became aware that a few sections had been acquired by a small group and Carrick farmed in on their lands at Stolberg. This farm-in allowed Carrick to attain a strategic foothold in the heart of a major oil and gas play. Carrick Petroleum Inc. is a privately held company and its shares do not trade on any public stock exchange. The shares of the Company have been issued through private placements to accredited investors only. The company has not filed a prospectus and is not required to file any financial reports publicly. Carrick Petroleum Inc. currently has 34,718,035 shares outstanding; and 16.7MM warrants outstanding for a total of 51.5MM shares on a fully diluted shares basis. Officers and Directors own 18.4% of the basic outstanding shares, and 15% of the fully diluted shares. There are currently just over 170 individual shareholders, with less than 5% non-resident ownership.